Three chefs decided to work together when they were in the back alleys of their restaurants taking a break one day. Calling themselves the Backstreet Bengs, Chef Eugene See from Birds of a Feather, Chef Miller Mai from ding dong and Chef Jeremmy Chiam from Le Binchotan will work together to present a six-hands dinner for two nights only on 17 October 7 pm and 31 October 7 pm. For S$90++ per person, guests will get to enjoy two dishes at each of the three restaurants that are walking distance from each other. Drinks are charged separately. Only 60 reservations will be accepted for each evening and you have to email [email protected] to make reservations. Chef Eugene See of Birds of A Feather will serve his Baked Eggplant from his new a-la-carte menu. It is a creation of Japanese eggplant marinated in housemade vegetarian yuxiang and baked, then serve with mozzarella cheese and fried mantou. 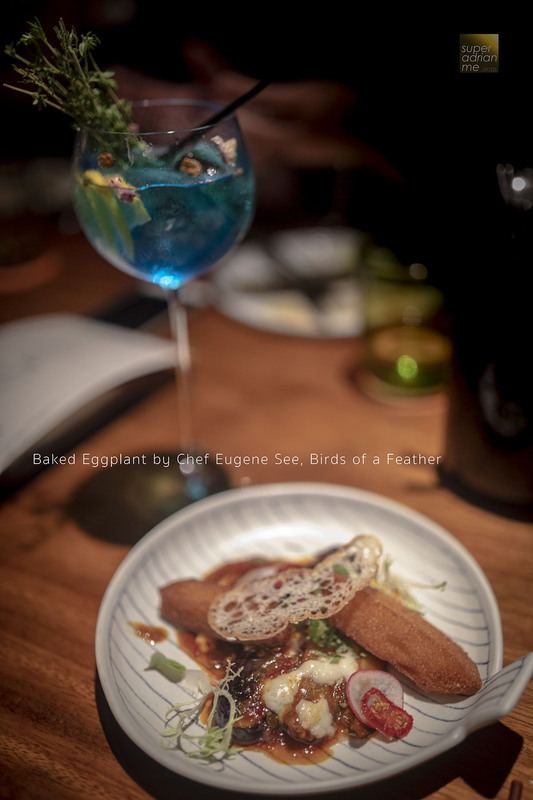 Chef Eugene See of Birds of a feather will dish out his repertoire of baked eggplant while his second dish is inspired by Amoy Street – Sichuan-style Chwee Kueh. The water cake is made in-house the traditional way with rice flour. 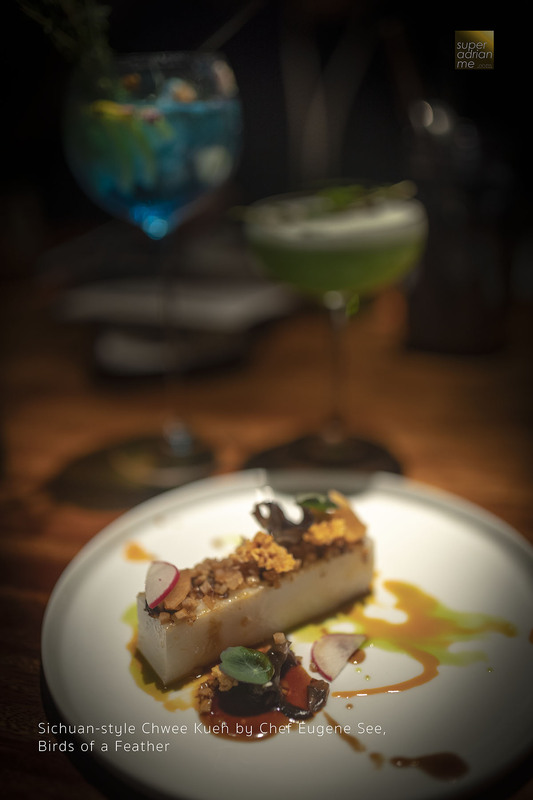 It is served in a long low block and given a spicy savoury Szechuan spin topped with crispy kohlrabi bits and Szechuan spicy red oil, then dressed with scallion oil, pickled daikon and black fungus. 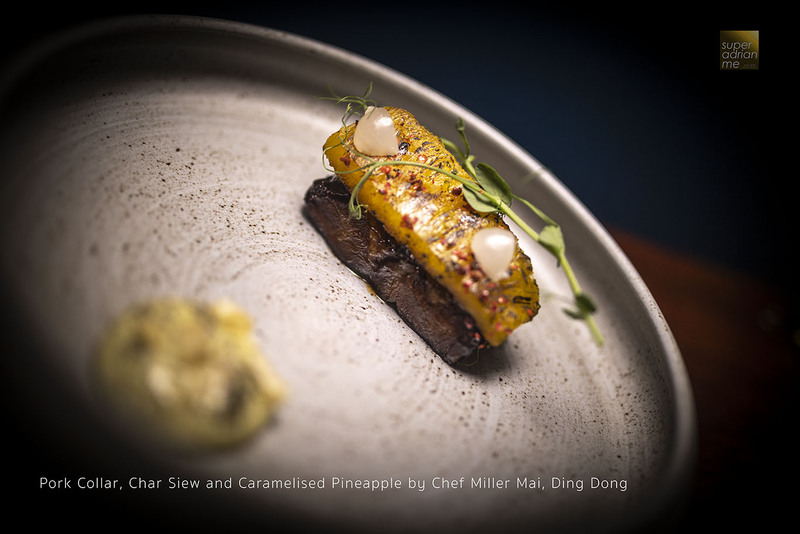 At Ding Dong, you can enjoy Chef Miller Mai’s signature Pork Collar with char siew and caramelised pineapple dish. He marinates the Iberico pork collar with char siew sauce and sous vide it. It is then topped with chicharon and sweet pineapple mousse. 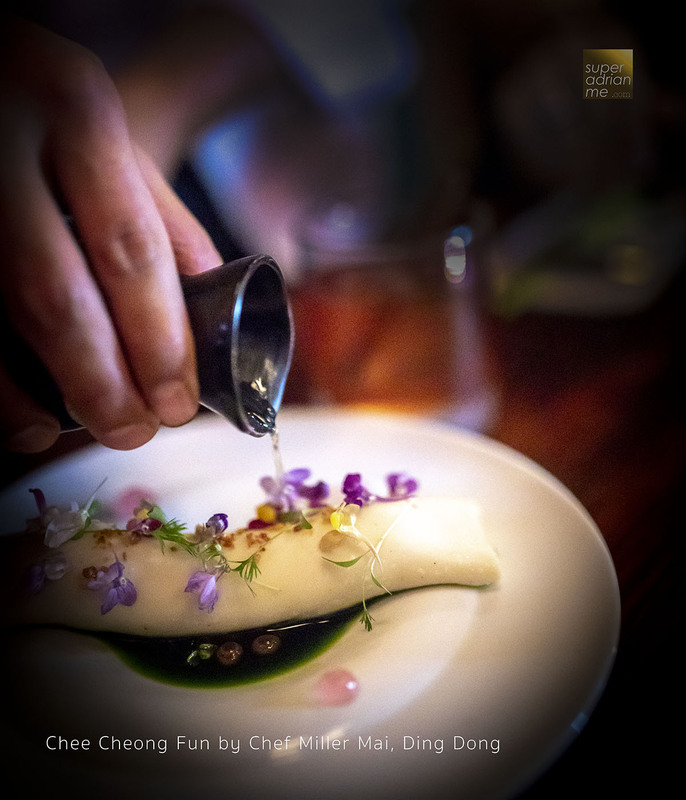 Chef Miller Mai of Ding Dong will be serving a very pretty chee cheong fun, also inspired by Amoy Street. What’s special about this chee cheong fun is the white sheets of scallops and egg white instead of rice sheets. Chef Miller uses these sheets to wrap crunchy tiger prawns and blue swimmer crab. It is served with a rich fish sauce, lime juice, clam stock and chilli. 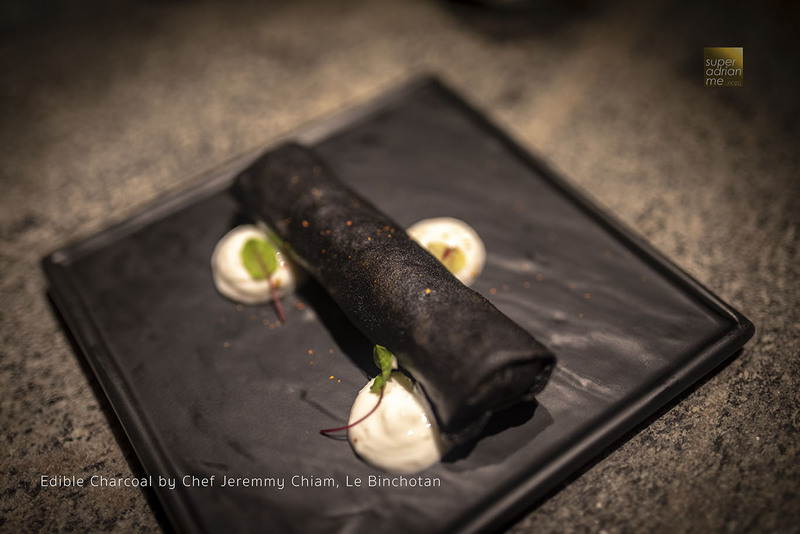 At Le Binchotan, Chef Jeremmy Chiam’s signature Edible Charcoal dish involves braising beef short ribs for 16 hours. This is wrapped in charcoal spring roll skin and accompanied by house-made garlic yoghurt. Chef Jeremmy’s Uni Okayu with Charcoal Youtiao is absolutely divine. 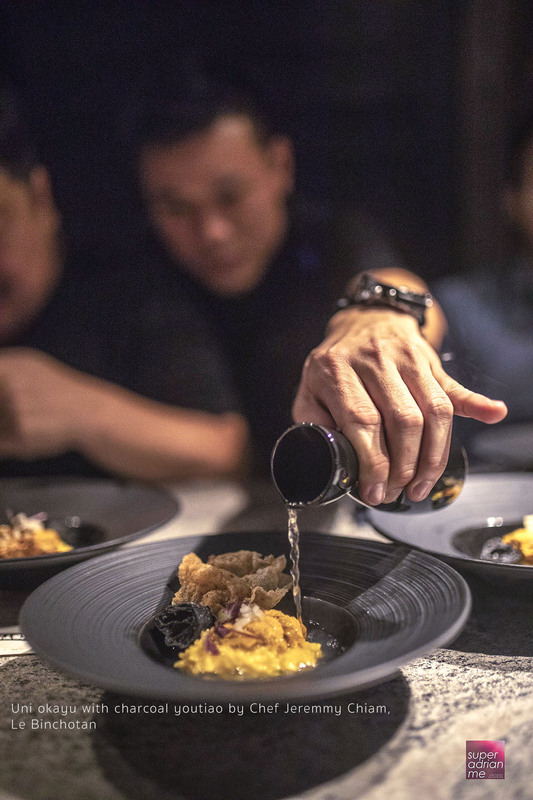 Inspired by rice porridge, the rice is served in a pool of rich kombu and scallop bouillon, garnished with crunchy charcoal youtiao and topped with fresh uni. Enjoy the best of three restaurants in a night but you better book early before the seats fill up.